Chieng Mai was the first vice-consulate, and became easily the largest and longest lasting. Vice-consulates subsidiary to it, permanently staffed with consular assistants and visited regularly by the consul and the judge, were established at Lakhon, Nan and Phre in the 1890s. The first vice-consul, EB Gould, was appointed in 1882 and was quick to build a house on a site beside the Mai Ping river. His successor built a new one, at the behest and expense of the Government of India, which contributed towards its upkeep and sent a guard of twenty Gurkha troops to protect the vice-consul. He sent them back after a few years for being more trouble than they were worth. A document of 1888 made clear that this site had been granted by the Siamese government. In 1892 the property was placed in the charge of the Office of Works, and in 1896 the post was raised to a consulate. The consul’s house was rebuilt, again on the same site, in 1914-16, in broad conformity with plans drawn up by Thrift Reavell of the Office of Works in London. New single-storey consular offices were built behind it in 1921, and the bund beside the river was extensively strengthened later in the 1920s. A deed of gift document was issued to the British government in 1937 to regularise the absence of formal title deeds: the address was then 127 Charoen Pratet Road. 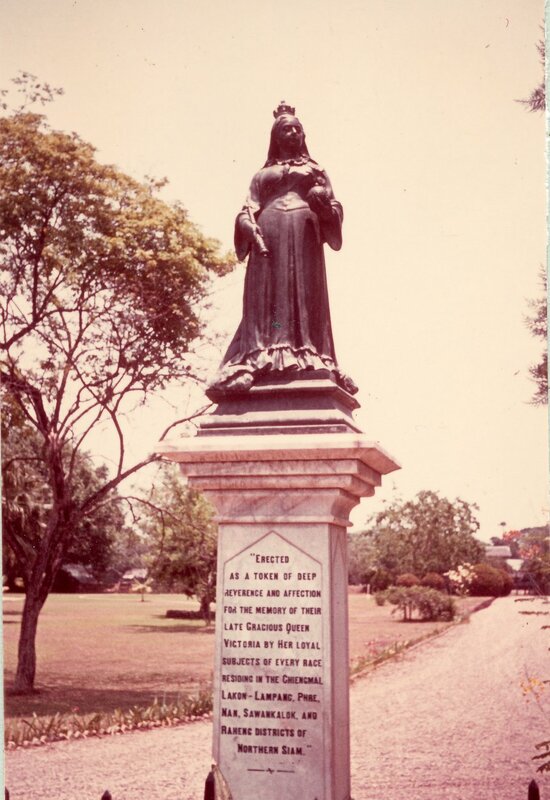 A small statue of a standing Queen Victoria on a pedestal stood, from soon after her death, by the entrance to the consulate compound, at the head of a straight path that ran across the site to the landing stage on the river side: the statue is now in the British cemetery in Chieng Mai. 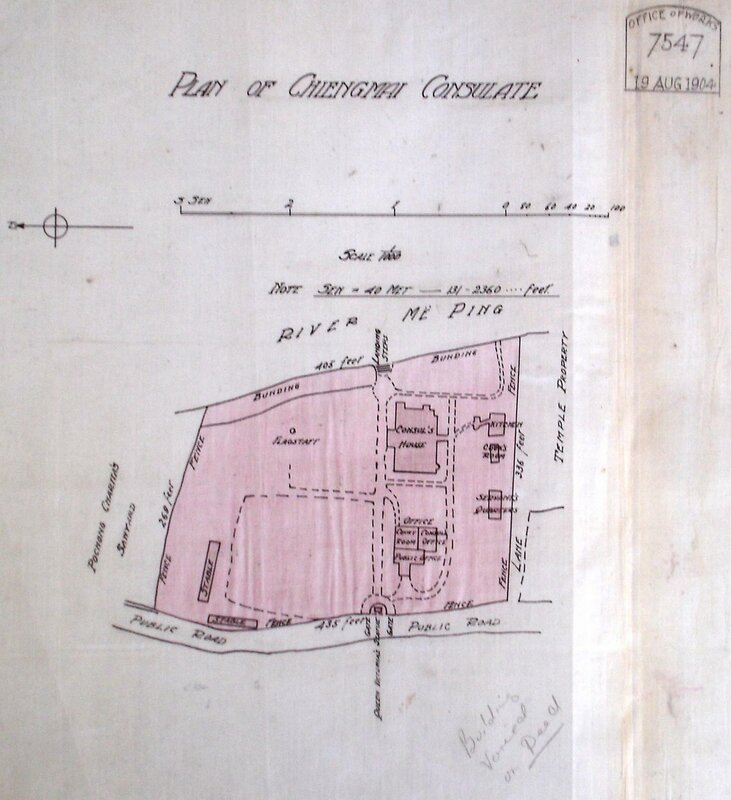 In 1907, the consul argued for an additional site in Chieng Mai on which to build a house for the vice-consul. Approval came the following year for buying a site for £200 and building a house for £900, to both of which the Indian government would contribute a moiety. The site selected was close to the consulate, a little further from the river, and the house was completed in 1910. It was let to the Chief Judge of the International Court in 1923 and the property was sold to the French East Asiatic Company in 1926. The buildings (as all other consulate buildings in Siam) were requisitioned and occupied by the Japanese military authorities during the Second World War, after which damage to them and the furniture was made good by the Siamese government. The consulate re-opened in 1947. 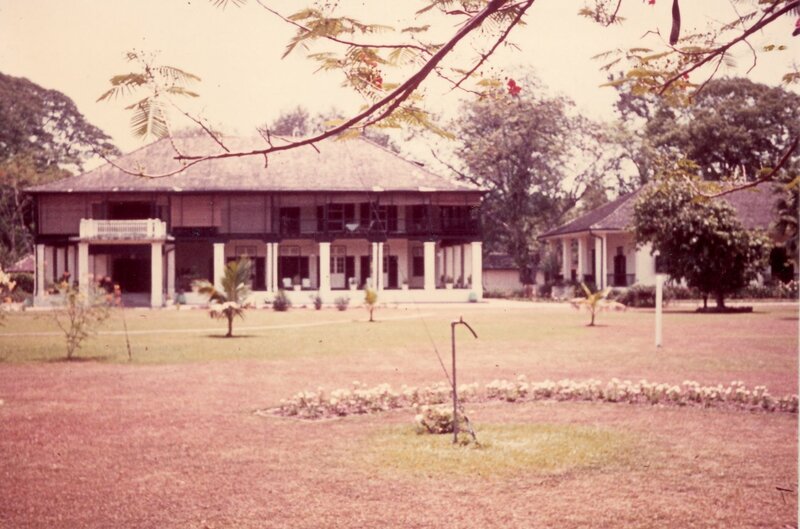 The post closed in 1970 but the compound was retained for occasional political and social use by Bangkok embassy staff, until it was sold in the 1980s. The site is now a hotel, and [?] includes the heavily renovated consul’s house. The most well-known Siam consul was William Alfred Rae Wood. He was born in 1878, went to Dulwich College, and was sent to Siam as a student interpreter in 1896. He served in Bangkok and in several vice-consulates before promotion to consul at Chieng Mai in 1913, where he remained until he retired, with the local and personal rank of consul-general, in 1931. He lived the 39 years of his retirement on his estate near Chieng Mai, publishing an entertaining, revealing and politically incorrect collection of memoirs in 1965 called Consul in Paradise: sixty-eight years in Siam, London: Souvenir Press. He married a Siamese girl in 1906, who outlived him. They are interred beside each other in the Chieng Mai Foreign Cemetery. 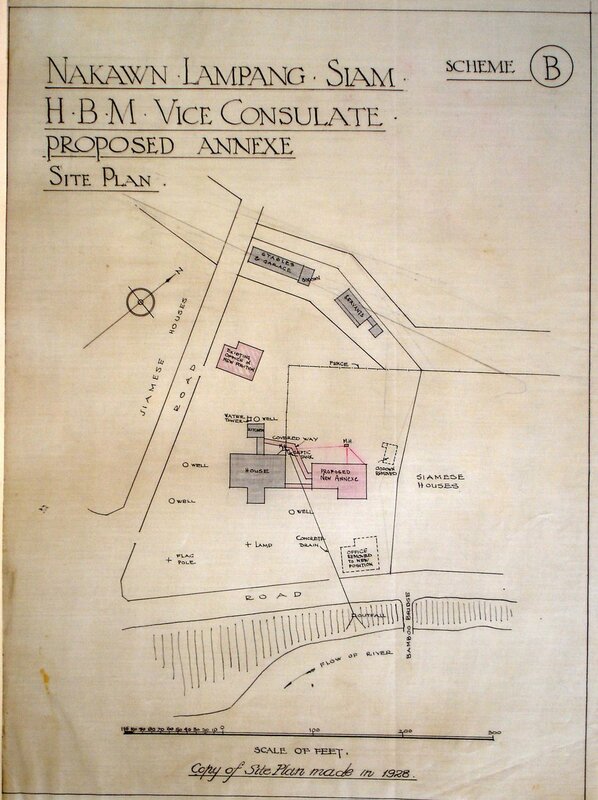 Site plan of consulate (North to the left), 1904. Entrance to the (by then closed) consulate, 1974. The Queen Victoria statue is just visible above the hedge. 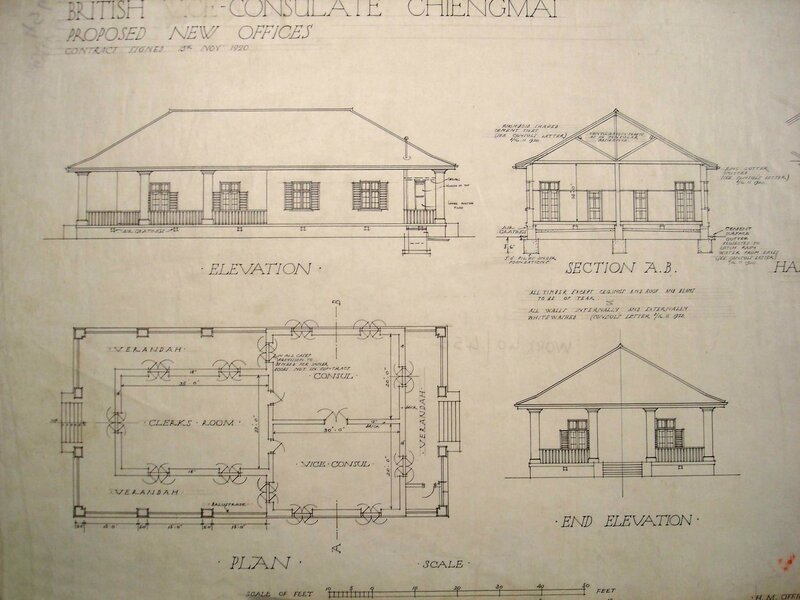 Drawing for new consular offices , 1920. Queen Victoria at the compound entrance, with path behind running across to the landing stage, early 1900s. 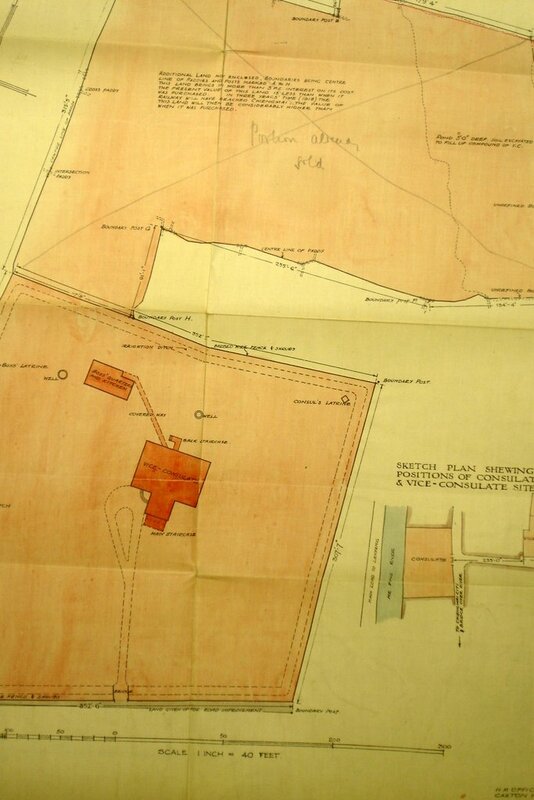 Site bought for the vice-consul’s house, completed 1909. The inset shows both sites. Lakhon (now Nakawn Lampang) was about four days’ journey (about 60 miles) south-east of Chiang Mai. 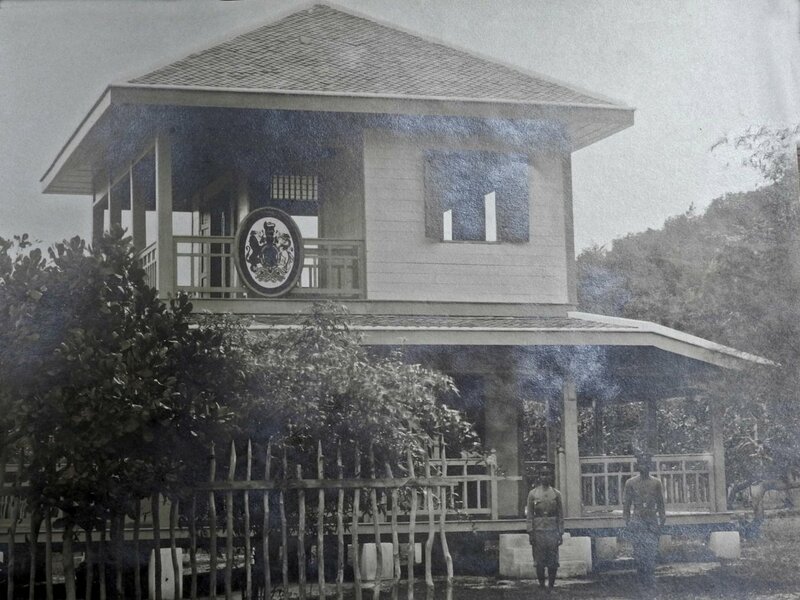 A small teakwood house had stood here for some years before 1899, occupied by a consular assistant under the superintendence of Chieng Mai, and visited by the consul and International Court judge. A site on the river for a bigger consulate was bought in 1903, on which a consulate was built in 1907-8, and added to at intervals until 1931. It was sold in 1950. About 130 miles due east of Chiang Mai, under whose superintendence the consular assistant at Nan worked. He drew a lodging allowance in the 1890s because there was no official accommodation. 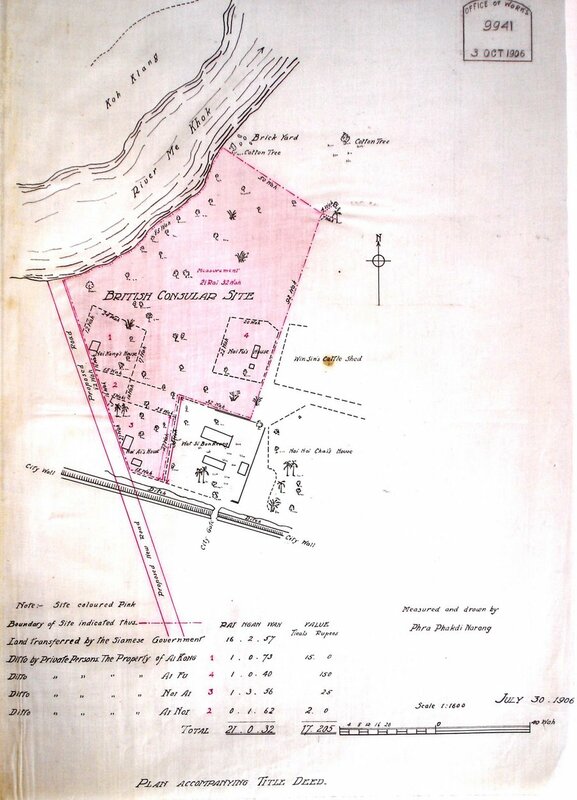 A site at Ban Kon, on the west bank of the river, was bought in 1898, two adjoining plots were added to it in 1908 and a consular house was completed here in 1910. The buildings were demolished in 1939 and the site sold in the same year. About one hundred miles south-east of Chiang Mai, Phre was under the superintendence of Chiang Mai. 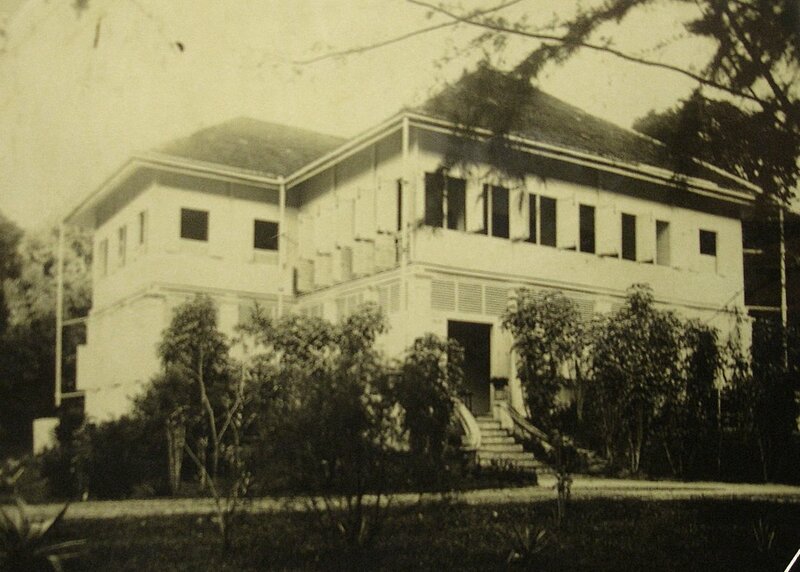 A plot of land was bought from the Siam Forestry Co Ltd in 1906 and a house erected in 1909-10. The Post was closed in 1907 and the Ministry of Works bought Wood’s building from him in 1908. It served as a rest-house until the site was sold to the Siam Forestry Department in 1923. 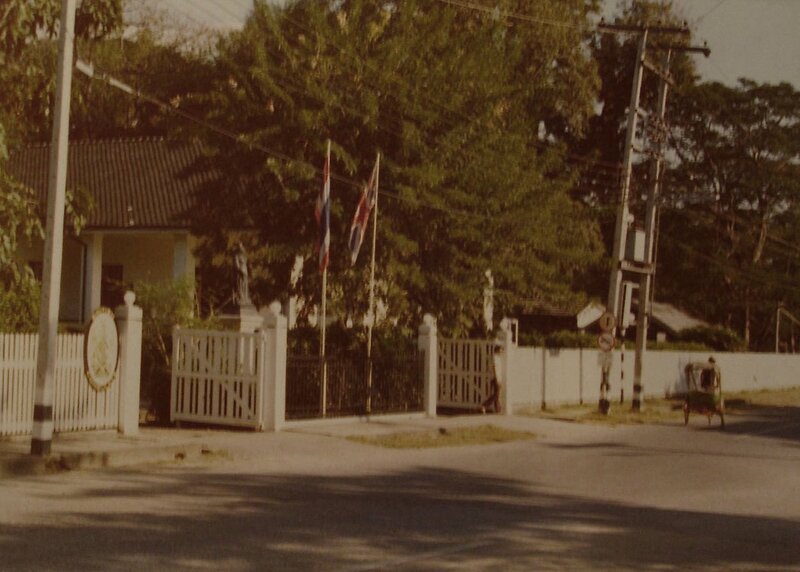 A different, small site was bought in 1939, on which a rest house was completed by 1941 for use by the consul at Nakawn Lampang on his quarterly visits. The site was sold in 1949. 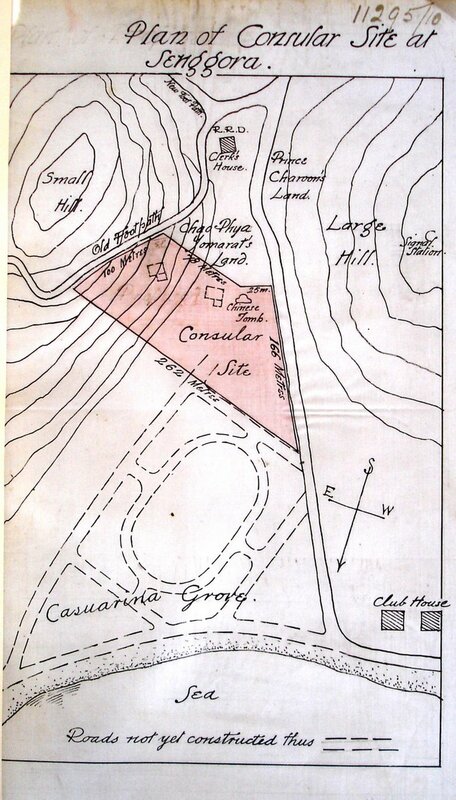 A four acre site in Narisorn Road was conveyed by the Siamese government in 1916, but it was never built on and the site was returned in 1925. 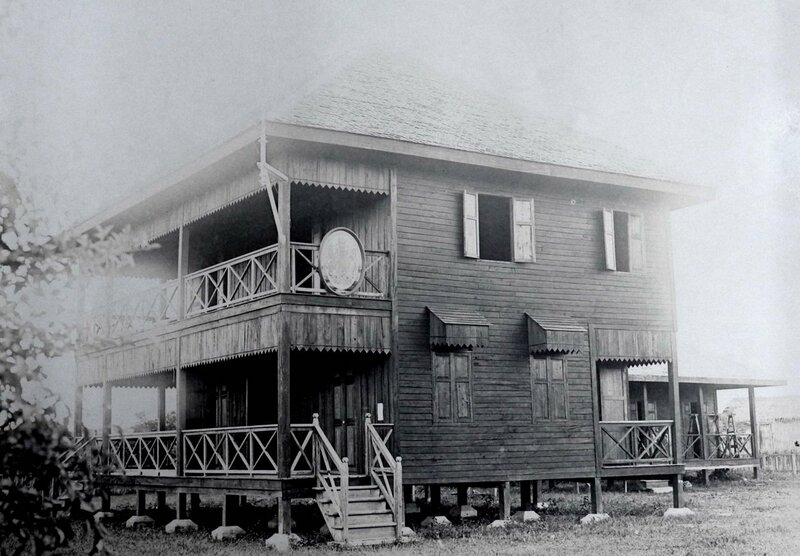 At Sengorra (now Songkhla), in the extreme south of Thailand, the Siamese government granted a site for a consulate on perpetual lease in 1910. Buildings were completed in 1911. The site was, for unknown reason, retained after the post closed. When the area was occupied in 1968, the site reverted to the Thai government, but the British nevertheless sought negotiation for compensation for the buildings erected. Patani was an outpost of Sengorra. A piece of land was bought in 1910, on which a rest house was built the following year. The property was sold to the Siamese Highway Department in 1926. Nakawn Lampang site plan, c. 1928. Songkhla, [unidentified building and date].